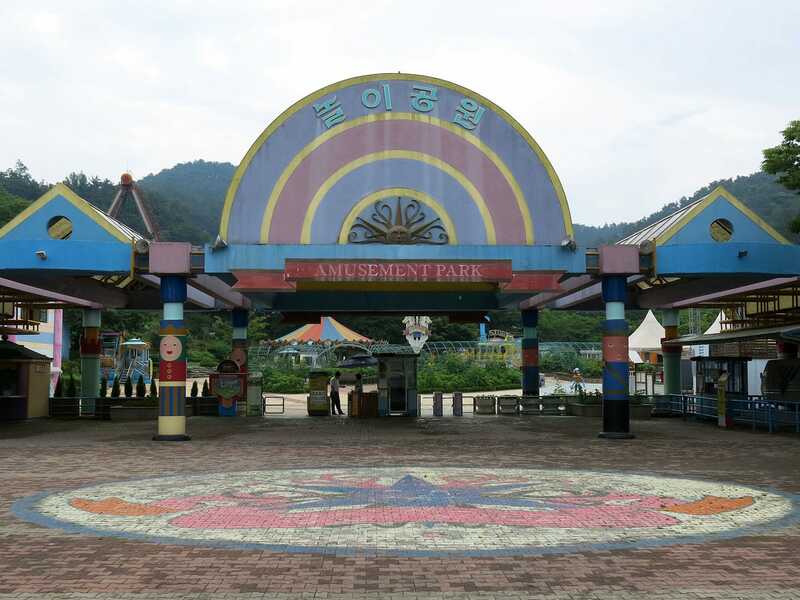 The entrance gate at Gwangju Family Land hasn't been repainted in years, meaning that what was once bright and colourful now looks abandoned. At first glance I thought that I'd arrived at a closed park, but on closer inspection, the ticket office was open, and in due course I was on board a free tram that takes visitors a kilometre or so to the main ride area. I had the entire tram to myself despite arriving about twenty minutes after opening on a Sunday morning. The park has two roller coasters, but both were closed today. A very worn out closed sign stood at the entrance to Dragon Chase, and large amounts of visible rust on the track gave the definite impression of a ride that was down permanently, a feeling reinforced by the blank "last inspection" panel. Atomic Mouse did appear to be functional, but was temporarily closed for my visit due to intermittent light rain. The Police School fun house was also closed because of rain, but almost everything else was open, including a selection of spin rides and an impressive looking log flume. Nothing on the roster appealed to me except the small aquarium at the back of the park, but that was good for about ten minutes at the outside. I spent a bit of time wandering around the park with my camera, but in due course it became obvious that the rain wasn't going to stop any time soon, so I decided to cut my losses. Namwonland is a tourist resort with shops, restaurants, cultural sights, and a small amusement park. The main parking area at the base of the mountain looked quite busy, so I decided to take an available space there and hike up to the park. This proved to be the wrong decision, as there was a much smaller parking area next to the rides that was almost completely empty. Enthusiasts attempting to retrace my steps should bear this in mind. 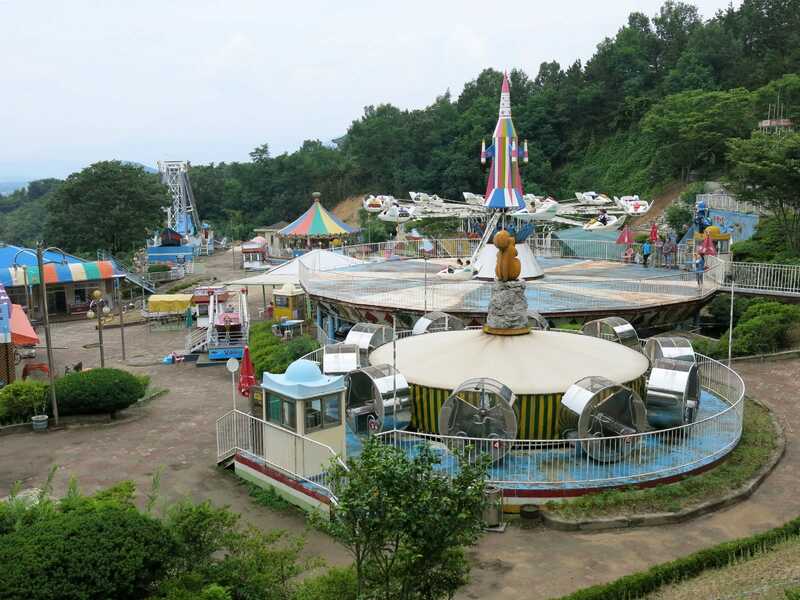 The condition of the amusement park was even worse than Gwangju Family Land, with almost all of the rides looking like they'd not been painted (or for that matter operated!) in the last five years. Having said that, the only attractions closed today were the Giant Wheel and the Ghost House. The powered Deer Train was the same type of ride as at Jeonju Dreamland, albeit with antlers rather than a dragon on the lead car.